Alex Steger of Baton Rouge had quite a Thanksgiving weekend at the 2008 Louisiana State Championship, held at the New Orleans Airport Hilton in Kenner, Louisiana. When the dust had settled, Steger picked up a total of three titles. Coming into the tournament, Steger was seeded ninth with a rating of 1997, just short of the Expert title that comes with a rating of 2000 or higher. 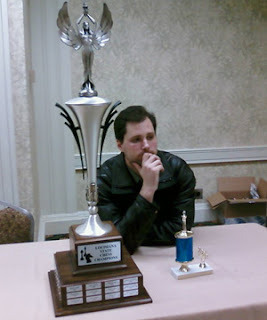 Steger’s impressive 6.5-0.5 performance at the tournament easily gave him the Expert title and was just enough to capture the 2008 Louisiana State Championship over 46 other participants. Steger added to his collection of titles by being elected President of the Louisiana Chess Association (LCA) at the LCA business meeting held during the tournament. Steger is the first person in recent memory to hold both the title of LCA President and Louisiana State Chess Champion. The title of state champion was not decided until the final round. Going into the final round, Steger was tied with six-time Louisiana Champion FM John D. Bick of New Orleans, with a quick draw between Steger and Bick the only blemish on either player’s record. Bick held an insurmountable tie-breaker advantage heading into the final round, so Steger was required to outperform Bick in the final round to bring home the title. After falling a pawn down, Steger rallied to defeat Aleksandar Karaivanov, a freshman at UNO hailing from Bulgaria who was playing in his first American tournament. In a wild game against perennial state championship bridesmaid Adam Caveney of New Orleans, Bick was not able to pull out a victory and had to settle for a draw, clinching the state championship for Steger. Bick finished second with a score of 6-1, while Caveney tied for third with defending state champion Mariano Sana of Baton Rouge and Mario Rodriguez of Metairie, all three finishing with a score of 5-2. Rodriguez took the first place Under 2000 prize with his performance. Bobby Roberts of Ruston, the player who easily traveled the farthest to attend the tournament, split the first place under 1800 prize with Jay Mitchell of Purvis, Mississippi, both players finishing with 4.5-2.5 scores. The top honors in Under 1600 were shared by Roland Bennett of Morgan City, Andy Beams of Metairie, and Ramon Tagorda, Sr., of Marrero, all three players finishing with scores of 4-3. Marilyn Pelias of of New Orleans took the first place Under 1400 prize with a score of 3.5-3.5 and Dex Webster, a second-grader from New Orleans, finished ahead of many older players to take the first place Under 1200 prize with a score of 3-4. The Kickoff Scholastic Chess Tournament, held in conjunction with the state championship, was also a success and attracted a total of 43 students in three sections. Dex Webster did double duty and took first place in the K-3 section with a perfect 4-0 score. Patrick Schwing, Charles Korndorffer, Dex’s brother Don Webster, Connor Larson, and Diensn Xing all tied for second in the K-3 section with scores of 3-1. Schwing and Korndorffer took second and third place, respectively, on tie-breaks. In the K-6 section, Oliver Slawson took first place with a 3.5-0.5 score. Sheldon Kappel, Riece Dudoussat, and Cecilia Tisserand tied for second with 3-1 scores, with Kappel and Dudoussat taking second and third place, respectively, on tie-breaks. In the K-12 section, Johnathan Glawson and Andy Beams tied for first with scores of 3.5-0.5, with Glawson taking first place on tie-breaks. Kyle Hecker and Daniel Folse tied for third with scores of 3-1, and Hecker took third place on tie-breaks. At the LCA business meeting on Saturday, in addition to Steger’s election as President, Jace Etienne of Morgan City was elected Vice-President and Caveney was elected Secretary/Treasurer. The state championship was ably directed by Ralph McNaughton and Douglas Stewart. Jean Troendle of Cajun Chess did her usual superb job of directing the scholastic tournament. The tournaments were organized by Caveney on behalf of the LCA.